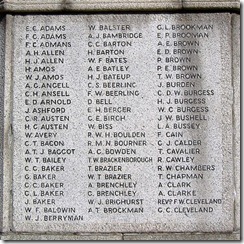 He was baptised on 15th March 1904 at Saint Mary Magdalene, Woolwich. 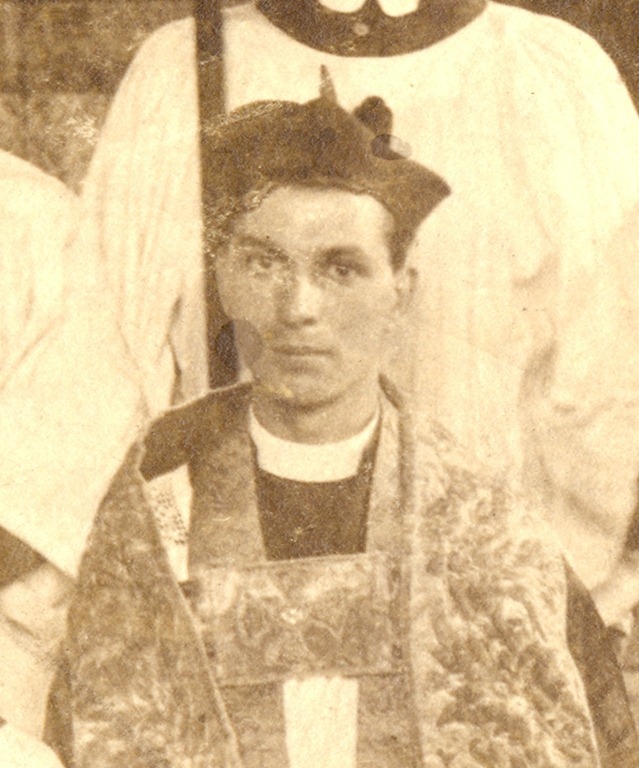 Ordained Priest by the Bishop of Lichfield in 1913, he served his Title as Curate of Christ Church, Tunstall from 1911 until 1913, when he moved to Porthill, for Mission work in the Potteries, being based at St. Andrews Church. This is the time he would have spent with the Troop as its Chaplain. 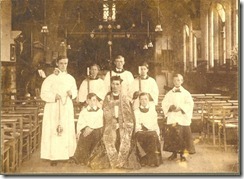 This picture 3 was taken in 1913 at St. Wulstan’s Church Longbridge Hayes. 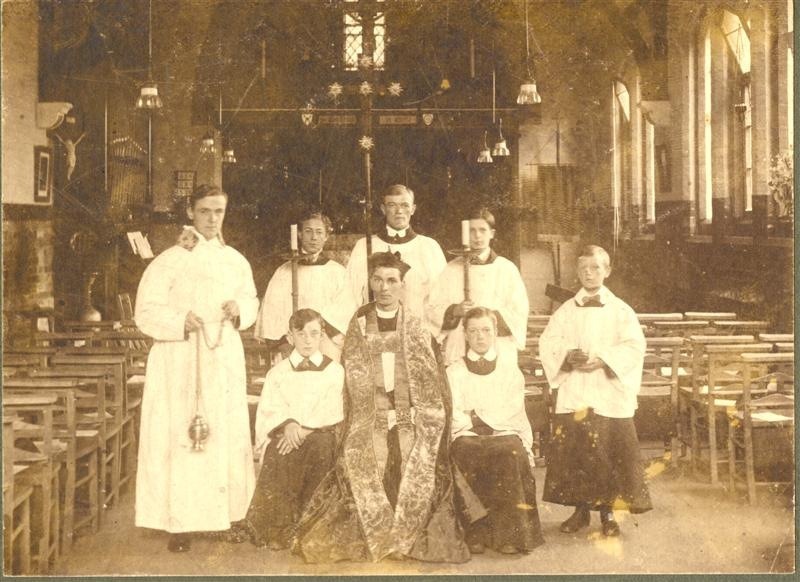 It is thought that all of the Altar Servers on this photograph were Porthill Scouts. 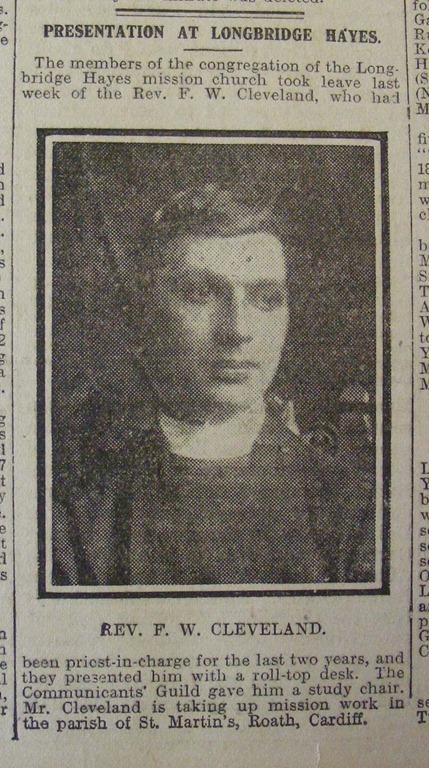 It appears from the article in the Sentinel (see above) 4 from 1915, that he spent some time after he left Longbridge Hayes, in Cardiff. The members of the congregation of the Longbridge Hayes Mission church took leave last week of the Rev. F. W. Cleveland, who had been priest-in-charge for the last two years, and the presented him with a roll top desk. The Communicants’ Guild gave him a study chair. 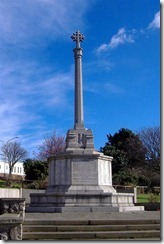 Mr. Cleveland is taking up mission work in the parish of St. Martin’s, Roath, Cardiff. 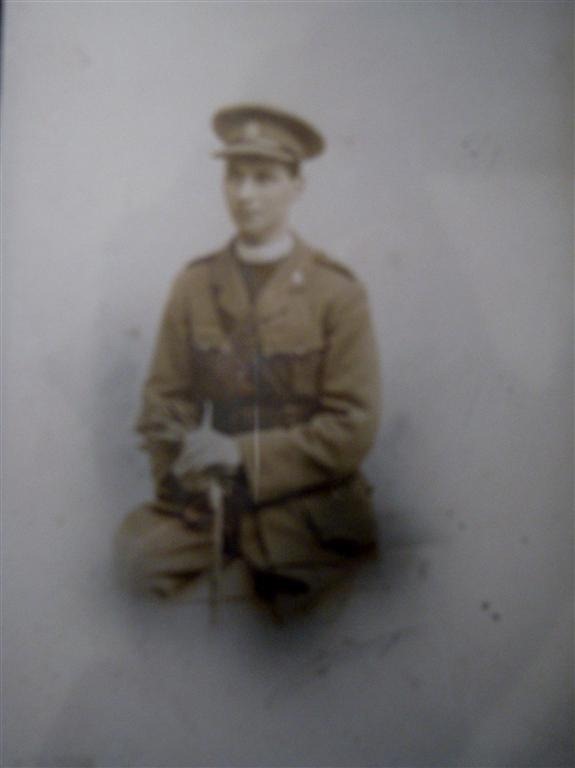 He was Senior Curate at St. Peter’s Hornsey, North London from 1915 (or 1913 according to some sources – unlikely) until 1916 when he became a Chaplain to the Forces 4th Class (Captain), attached 1/6th Battalion North Staffordshire Regiment . He died at No. 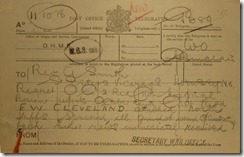 2 British Red Cross Hospital, Rouen, on 11th October 1918 from wounds received on the 4th October. 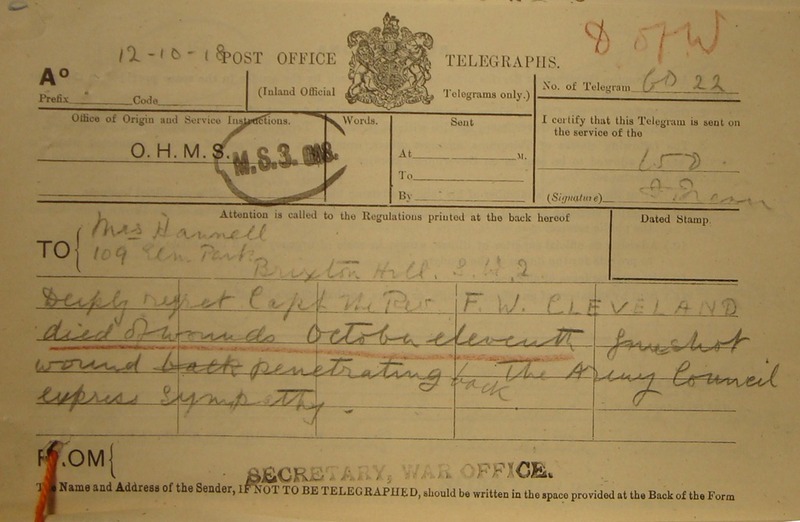 Frederick’s Army record has survived and from this comes the handwritten telegram slips telling firstly that he had been seriously wounded by a gun shot (not by shrapnel as stated elsewhere) and the second telling of his death. 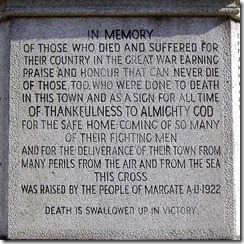 The first was dated the 11th October 1918 (the day he actually died) and the second is the day after, the 12th October 1918. 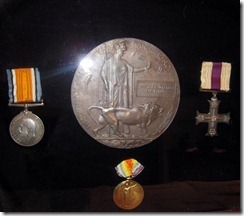 The medals are from left to right – the British War Medal, the Allied Victory Medal and the Military Cross 6. The plaque in the centre is The WWI Death Plaque (Dead Man’s Penny) which was issued to the next of kin of servicemen who were killed in the Great War between 1914 and 1918. News has just received by the Vicar of St. Andrew’s Porthill of the death from wounds received in action, of the Rev. Frederick Walter Cleveland, Chaplain of the Forces, formerly assistant priest at Porthill. 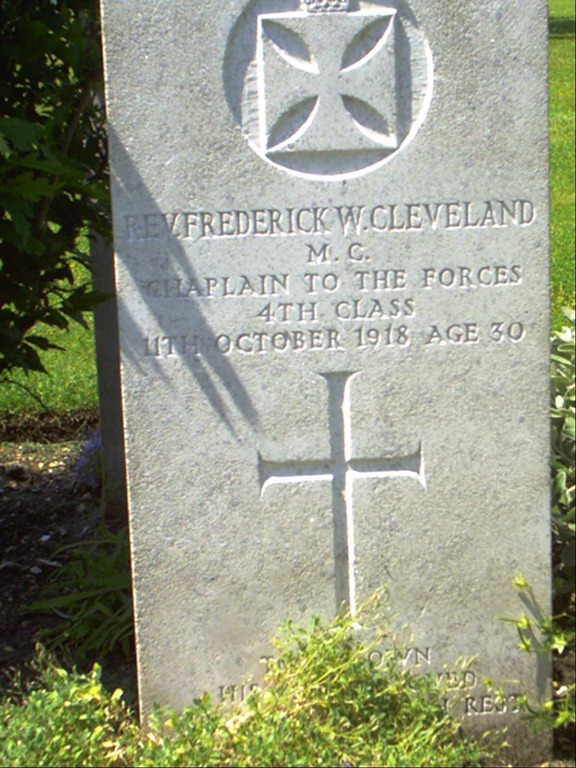 He was badly wounded near Cambrai on October 3rd, and was removed to a Red Cross hospital at Rouen, where he passed away on Friday last. 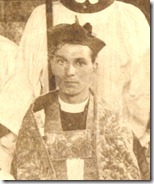 Mr. Cleveland, after a theological training at Mirfield and Lichfield, was ordained deacon in 1911 and priest in 1913, his firs curacy being at Christ Church, Tunstall. In 1913 he accepted the curacy of St. Andrew’s, Porthill, with the special charge of the mission district of St. Wulstan, Longbridge Hayes. He world with very great zeal and enthusiasm and speedily made his mark in the parish, his influence over young people being very noticeable. At Longbridge Hayes he brought about the renovation and adornment of the Mission Church, and, mainly owing to his exertions, an important addition was made to the buildings by the voluntary labour of the people. 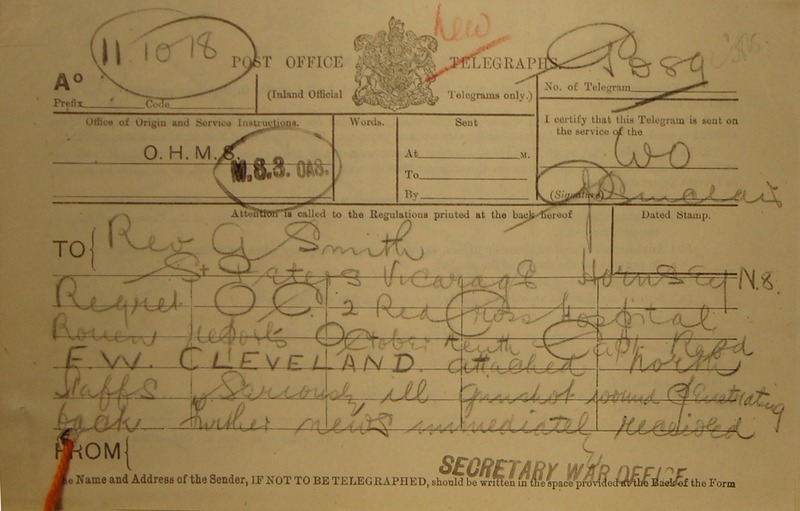 Early in 1915 he volunteered for service with the Army Chaplains’ Department, but not until May 1916, after his departure from this district, was he called upon. 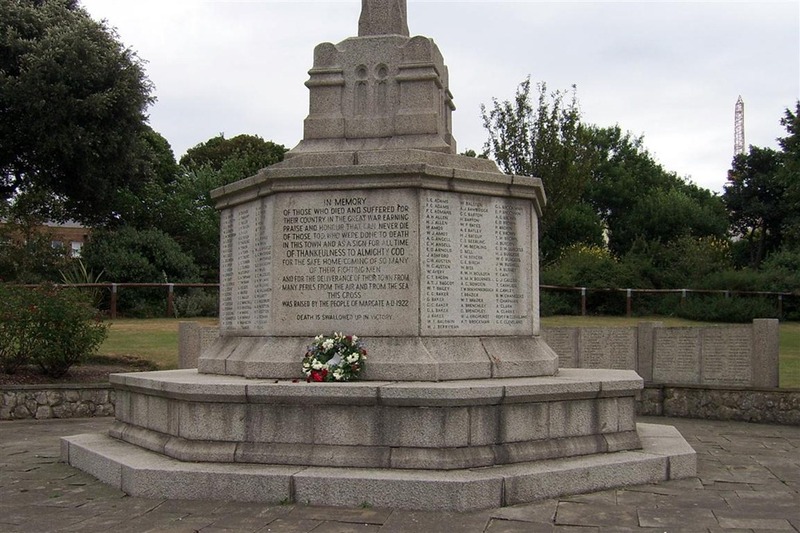 Then he was attached to the local battalions of the 46th (North Midland) Division, and served continuously with them up until the time of his been wounded. He was as faithful and strenuous in his work as chaplain as he was a parish priest, and was popular and highly esteemed by both officers and men. 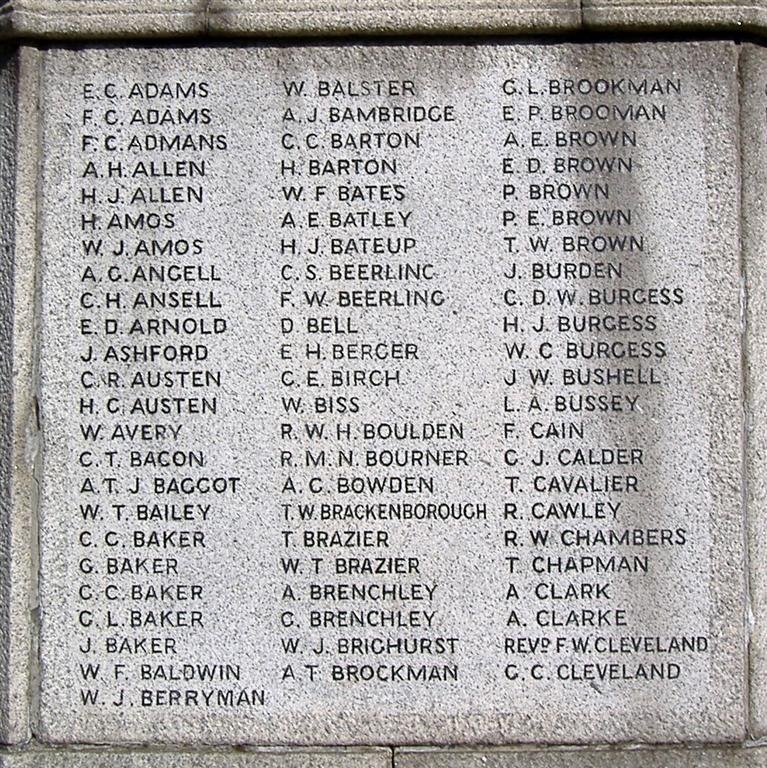 He was due for leave at the end of September, but owing to a shortage of Church of England chaplains with his division, and knowing that his men were due to go into action, he generously gave up his leave and allowed one of the Nonconformist chaplains to take his turn. He went into action in the fighting in which the North Midland Division distinguished itself recently, and there he received his death wound. His death, at the age of 30, will be lamented by the Church of which he was a faithful priest and by his many friends and spiritual children in this district. 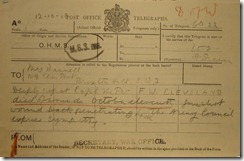 When the details of his will were published, he was listed as living at 56 Lausanne Road, Hornsey, Middlesex. His estate was managed by his sister Constance and he left £229 2s 8d (about £8000 in 2012). 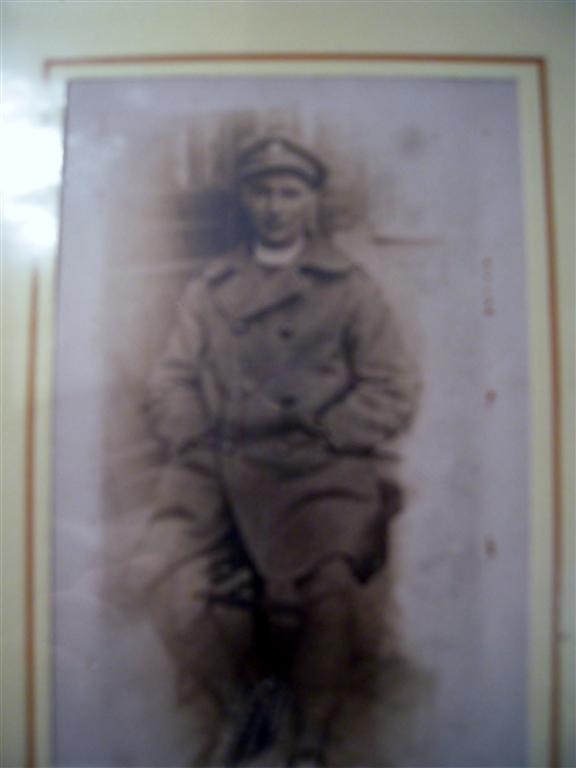 From his army record comes the information that amongst his effects that were returned to his sister, were his crucifix and stand (which had been damaged), a communion book, an alter cloth, a pipe & tobacco, 3 lead pencils and his false teeth! 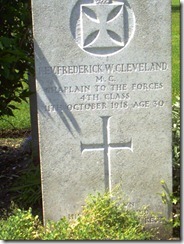 He is buried in St Sever Cemetery Extension, Rouen, Seine-Maritime. 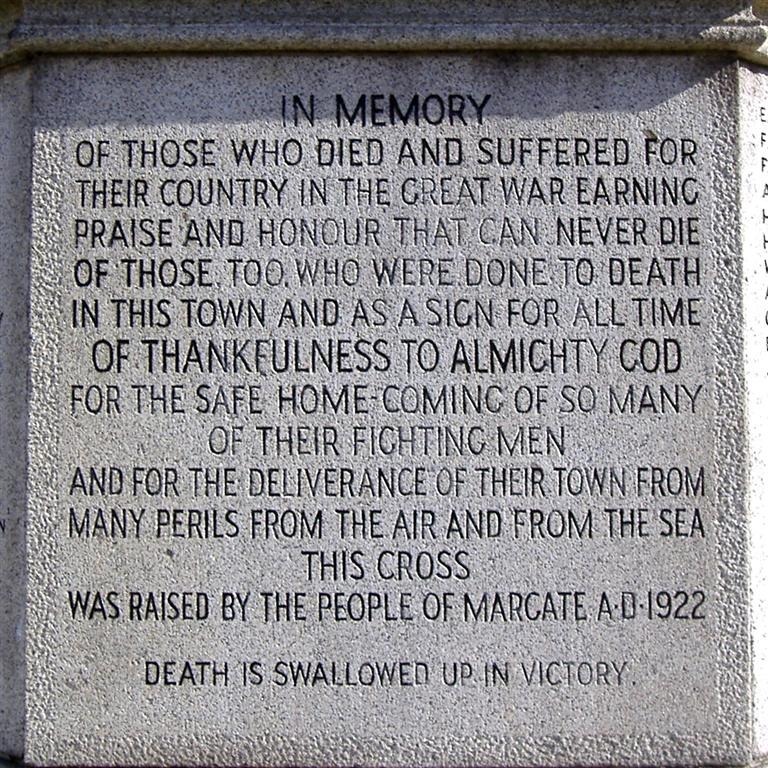 He is remembered on our Memorial, the St. Wulstan’s Memorial, the Margate War Memorial and the Aldershot Memorial.